Our dogs love to curl up somewhere soft and warm to just relax or take a long nap. Like a child loves their own room, your pet loves his or her own place to just hang out. There are certain things to consider when creating a dog bed, such as the size of the dog and where the bed will be placed. 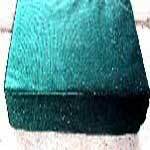 Here are dog bed patterns for all types of pet beds. Learn how to make a bed using old socks and t-shirts, a super comfy bed and many more. 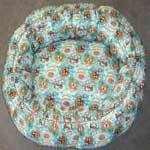 No matter what your pet's size or demeanor, you are sure to find just the right dog bed pattern here. 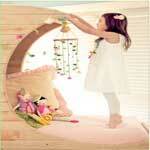 Construct this fluffy pet bed so that your pooch will be comfortable all through the night. Old socks, t-shirts, blankets are some of the items that make up this puppy bed. Using towels for stuffing this is truly an easy and comfy bed for any dog. 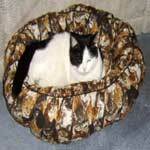 This one is sew-easy and your pet will love you for it. Large dogs need a bed too. This bed is perfect for large dogs. 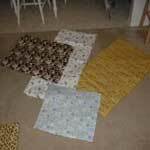 Easy to follow project for a pet bed that works for dog or cat. 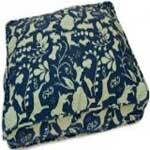 A foam pad plus material is all you need for a good dog bed and sew-easy. This bed is easy to make and easy to care for.